Mao Zedong never said that. It was actually a hundred flowers. As you take a look at our new Last.fm Discover app, you will find we don’t have a thousand tags either. It’s close to 2 million tags that have been created over the years by our members to describe the music they love. It’s these user-generated tags that power our HTML5 Discover web app. We launched it yesterday and it’s available around the world, without restrictions and without advertising interruptions. Last.fm Discover is a personalised music player that introduces you to bands from around the world by letting you browse through musical styles that you may already know or want to learn more about. You won’t find the latest X-factor winner or the latest plastic boyband manufactured by evil scientists in a lab somewhere. Some of them are quite rough around the edges – make use of the ban button when you come across something unlistenable – but you’ll also reach for the love button as you discover diamonds in this amazing library of tracks. 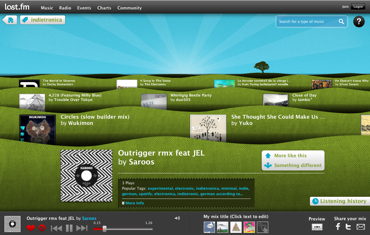 This diversity and eclectic view of the musical landscape is what Last.fm is all about. We don’t live in a cookie cutter world of hackneyed generic labels for music. Most music sites include the standard dozen genres (pop, rock, urban, etc.) and that doesn’t adequately describe the diversity of music out there. Our tags system encourages the weird and the wonderful, the micro-communities and new scenes that are springing up as fast as new, independent bands are formed. Last.fm Discover celebrates this, and features more than 500,000 artists and labels who have uploaded their music to reach the ears of the Last.fm community. For many of these bands, the main desire is to be heard and enjoyed. They don’t have a piracy problem, they have an obscurity problem. Supporting independents has always been core to Last.fm. At least 20% of the music played on our streaming radio services already comes from these independent artists (and they are all paid via our Artist Royalty Program). We hope you enjoy discovering new music via our new app, and that you support the independents who make it. They, more than any shiny new gadget, venture-capital supported music service or giant record label, are the future of music. It won’t open in Opera web browser. Could you please add some sort of “run at your own risk” option rather than just refuse to load in an unsupported browser? Thanks in advance. 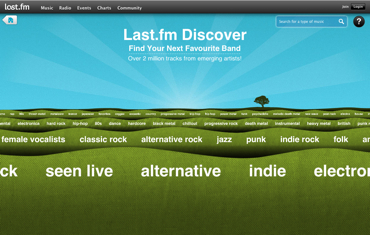 Awesome :-) Last.fm always supporting new (good) stuff. HTML5 and Independent artists FTW! It doesn’t work in chrome on osx for some reason. It’s explained in the blog post, but it’s not obvious on the page that it’s restricted to Artist Royalty Program (and free/unrestricted licence) artists. So it seems weird when some tags don’t have the obvious candidates. It’s a bit jittery in the transitions. The search box doesn’t have autocomplete. Looks neat, but songs don’t play in Chrome on Linux. Looks great.. Thank you…., but it doesn’t work right now. The Songs never starts. Anyway, thank you. and when i searched for “swing”, it couldn’t find anything and suggested me a broader tag like “nerdcore” or “new romance”!!!!! I’d love to see us add auto-complete for our tags. I’ll ask them to add it to our backlog. first run, clicked a tag and was having a listen. clicked on “more like this” and noted the shifts. clicked again. upon third click, the field cleared… no future tracks? so clicked on “something different” to see if it would regress the changes. oops, it switched tracks immediately. OK, start over. click tag. whilst track is playing, click on history. attempt to click on “return to discover”, but nothing happens. when track ends, that’s it. game over. You might or might not be aware on how seriously I’m addicted to last.fm. MATTHEW is correct..OSIRIS is marked. So are all the major FRENCH MOB in NEVADA with the QUEEN. So, there goes BERRIRO- HURE- GROSS. And TEXAS has already lost CARON DISNEY CAPSHAW. And with CHENES and CALMASHE . POPPINDA went with DATIL and now DOOPPIN got a call. MP3 did her KIDDOMP on KANSAS and ROBLESS PARK. Looks useful but doesn’t work with Google Chrome on Linux. Hopefully a fix for this can be found. Hooray! I love it. Thanks so much, this is great! Works fine in Google Chrome on Windows Vista – glitchy in Internet Explorer, but then it is IE.